CodeIgniter Session Tutorial: This post will show you how to start and destroy session in codeigniter. Sessions are used to maintain user's state and keep track of their activity on your website. Every user is associated with a unique session ID which will then be stored in a session cookie. But for additional security you can store sessions in database and verify the session id from the cookie against the one from DB. 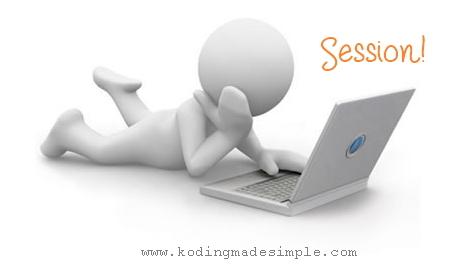 CodeIgniter's Session class takes care of session related tasks effectively. For each session it stores by default some basic details like session_id, user ip address but also permits to set custom data in sessions. In order to start session in code igniter first you'll need to initialize the session class and set userdata. You can either do it by auto-loading session class inside application/config/autoload.php or load it individually in your controller. Once loaded you get to access it through the handle $this->session. Using the method set_userdata() you can set session data in codeignitor. Again you can use two different ways to store data in session. The function returns FALSE if you try to access a session key that does not exist. Just like setting session data, you can unset them using unset_userdata() function while the session is still alive. Use the method sess_destroy() to clear the current session. Once you run this, all your userdata will be cleared out and you won't get to access them and not even flashdata. So make sure to call it as the final step like when user logs out of the site. That explains about handling sessions in codeigniter. Just make sure to set encryption key in config.php file even if you don't intend to use encrypted sessions. This will keep away the hackers from manipulating session data.